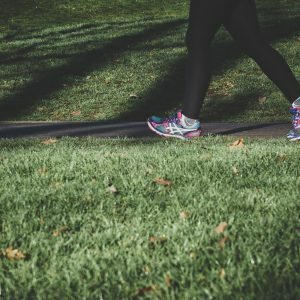 While most of us know about the health benefits of walking to ensure we get enough exercise, some of us are a little more committed to the concept and even make sure every step is counted through trackers on our smartphones or Fitbits. Are you one of those walkers who paces back and forth in the evening to make sure you’ve reached that magic number of 10,000 steps? If so, you may want to rethink that number after you read this. It turns out that the “10,000 steps” marker has little scientific basis to it. It was apparently developed by a Japanese walking club in the 1960s who settled on it as a nice round number without actually calculating whether that number makes sense scientifically. While it’s assumed that the average person walks about 6000 steps a day, new federal activity guidelines suggest a minimum of 150-300 minutes/week of moderate-intensity activity for adults, which means you should realistically aim for closer to 7,500 steps per day. But that’s a minimum, and when it comes to exercise (especially if you’re hoping for some weight loss), more is better. Over at Very Well Fit, you can find a chart that suggests a different number of steps depending on your walking intensity and goals. And feeling motivated? Then read the inspirational story of 66-year-old David Kirkpatrick, who set himself the extremely ambitious goal of walking 100,000 steps in a day. To find out how, lace-up your comfiest sneakers and read here.